Just in time for Mother’s Day, U.S. Senator Ben Cardin (D-Md.) re-introduced yesterday a joint resolution to ratify the Equal Rights Amendment (ERA) to the U.S Constitution. S.J. Res. 15 was introduced with 26 original cosponsors including Senator Mark Kirk (R-Il). The resolution would remove the deadline set by congress for ratification of the ERA. U.S. Representative Jackie Speier is expected to introduce an ERA resolution in the House. The ERA originally passed congress in 1972. Like every proposed constitution amendment, after it passed by a two-thirds vote of both the House and Senate, the ERA was sent to the states for ratification. Congress, however, had imposed – in the preamble of the ERA – a seven-year deadline on the ratification process. That deadline was eventually extended to June 30, 1982. Thirty eight states must ratify an amendment before it can become part of the U.S. Constitution. Thirty five states ratified the ERA by the 1982 deadline. If the deadline is lifted, only three more states would need to ratify the amendment. This is called the “three-state” strategy. 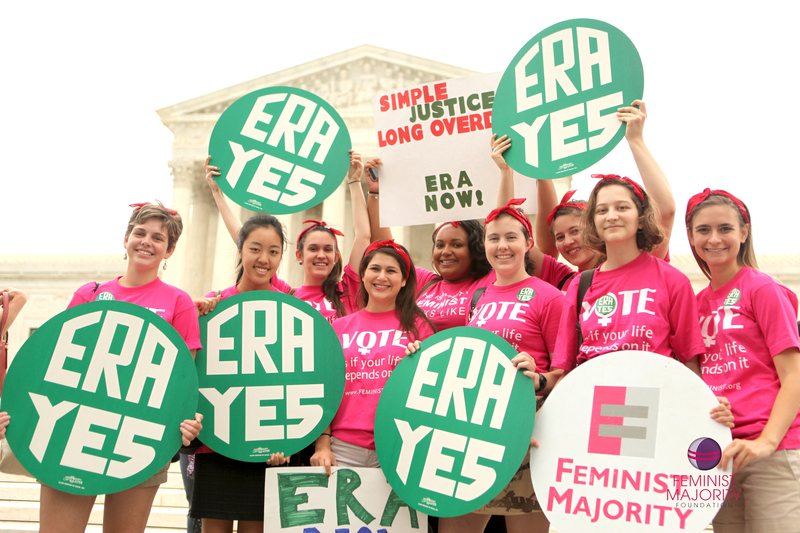 As part of the strategy, ERA activists in unratified states are working to clear a path for the ERA. The Illinois State Senate passed the ERA in 2014 with a strong 39-11 vote, and in February 2015, the Virginia State Senate – which never took a floor vote on the ERA during the campaign in the 1970s and 1980s – voted to pass the ERA for the fourth time since 2011. “As America prepares to celebrate Mother’s Day, we should be working to ensure that all women realize the promise of equal protection under the law. We cannot allow an arbitrary deadline to stand in the way of equal rights for our mothers and daughters, wives and sisters, aunts and grandmothers,” said Senator Cardin. As Gaylynn Burroughs, the Director of Policy and Research of the Feminist Majority Foundation, explained in the Winter 2015 issue of Ms. magazine, The need for the ERA has only increased since 1972. “Women have made numerous gains over the past four decades from Title IX to the Pregnancy Discrimination Act to pay equity to the Violence Against Women Act and much more.” She continued, “But all the federal legislative gains are just that – legislative. They can be wiped out by a hostile Congress or Supreme Court, or chipped away slowly and insidiously.” Burroughs cites last year’s Supreme Court Hobby Lobby decision as one example of recent rollbacks. Senator Bob Menendez (D-NJ) has also introduced an ERA resolution that would begin the ratification process over from the beginning. Click here to sign the petition urge members of Congress to support the Equal Rights Amendment by becoming co-sponsors of both the Start-Over ERA and the resolution to lift the time limit on the current ERA. The first E.R.A. campaign came closer to victory than most people realize. Yes, we were “three states short,” but if just EIGHT individual State Senators had changed their votes (3 in Nevada and 3 in Florida in 1975 and 2 in North Carolina in 1977) the E.R.A. would have had 38 ratifications and been part of the Constitution since March 1, 1977, just over two years before the original deadline. Had just SEVEN switched their votes (3 in Nevada in 1975, 2 in North Carolina in 1977 and 2 in Florida in 1979) it would have been ratified on May 24, 1979, just barely into the extension period. We can’t let 7 or 8 people who served decades ago block equality for all Americans in the 21st Century ! Go E.R.A. !